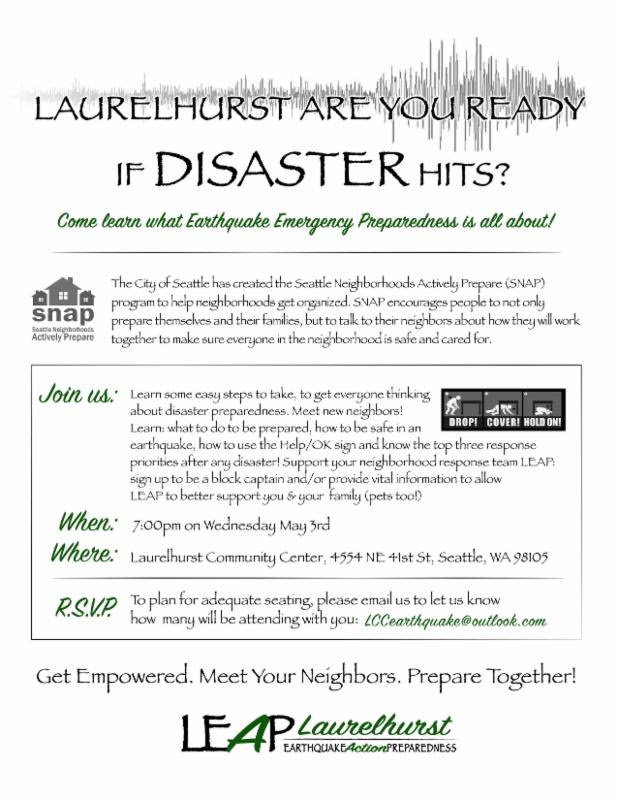 The Laurelhurst Community Club (LCC) is holding a special meeting tonight from 7-8pm on Earthquake preparedness at 7pm at the Laurelhurst Community Center in the Fireside Room. Carl Leon, a representative from the City's Office of Emergency Management, will present an "Expanded SNAP (Seattle Neighborhoods Actively Prepare) Earthquake Preparedness" class, outlining steps on how to prepare for disasters. It introduces participants to basic information on personal and family preparedness, including how to develop a disaster plan and an emergency supply kit. In addition, this presentation provides guidance and tools for organizing with neighbors. Participants will become familiar with neighborhood response priorities and strategies for working together with neighbors to ensure an effective neighborhood response. Neighbor John Temple, has been working with LCC on earthquake preparedness and has started LEAP (Laurelhurst Earthquake Action Preparedness) for neighbors to learn how to prepare households in the case of a large earthquake, when it hits what to do, how to get help, how to help others and how to get the neighborhood ready. John said he is also happy to help with setting up an organized block system or improving one that may already in place. He said that at the August city-wide block parties, those neighbors involved in coordinating could be a great help getting the neighborhood safer. He added that "working together can be fun, getting to know your neighbors better and all. Where to evacuate to if necessary could be important, too. Neighbors help neighbors. Once Laurelhurst is organized it will have less effort to maintain." If the big one comes, we are in trouble. We are not yet organized to be able to take the best care of individual households with their children, disabled people, older adults, pets and more. This can be done. It takes more than just having water, food and meds for yourself. We need people at the least to join their individual block groups and better set up within their own households so they are not a drag on the ones who are completely prepared and know their block captain. Consequences from a serious earthquake may include utility outages for prolonged periods, significantly delayed fire and police response, houses slipping off foundations, house fires, burst water pipes, broken gas lines, trapped and possibly seriously injured family members and neighbors. Some authorities recommend that we prepare to live with only our own resources for as long as a month. It's a daunting challenge, but we can take steps now to be more prepared and comfortable if disaster strikes. The City has an extensive Emergency Management website listing resources and recommended steps to take to prepare for emergencies. I have taken on the task to help all of us get organized. If you get contacted by a neighbor to join a group of about 20 blocks, work with them. If you don't have the time or inkling to participate further just get true info and give info so you can be helped. Simple things like giving people that are volunteering your info. Things like what are your pet's names, do you have older or disabled people in your house, phones to call you, as a participant that registers you will get a sign to post that you need HELP or are OKAY in your house. Volunteers will be coming by to check for registered people with a yellow sign and help if you need it, knowing who is in your house is paramount if your house happens to be one of the one that collapses. People who are registered and doing minimal efforts to organize within their block will be most quickly helped because of known circumstances within. Remember there could be no water, no sewer, no electricity, no police or fire services, no cellphone, no internet, and many more issues. Learn how to prepare, how to be safe, how to use the Help/OK sign, and know the top three response priorities after any disaster. Support your neighborhood response team, LEAP. Sign up to be a block captain and/or provide vital information to allow LEAP to better support you and family and pets. For more information, to find out about your block watch and RSVP for the event, email LCCearthquake@outlook.com.